The Wiki is a country directory for UAV pilots to share their travel and flying experiences around the world, such as going through customs and how to obtain permits for flying, for example. The Wiki also includes information on national and local laws when available. We would like this to be a community-driven effort, which is why we decided to use a Wiki. In sum, we’d like to crowdsource the content for this Wiki. Our mission is make it the most popular and useful resource on the web for UAV pilots. You can help by adding your experience and knowledge directly to the Wiki. Thank you! And many thanks to my Research Team for all their hard work on the Wiki. A conversation with my colleague Sinan Aral at PopTech 2011 reminded me of some earlier research I had carried out on the mathematics of war. So this is a good time to share some of the findings from this research. The story begins some 60 years ago, when British physicist Lewis Fry Richardson found that international wars follow what is called a power law distribution. A power law distribution relates the frequency and “magnitude” of events. For example, the Richter scale, relates the size of earthquakes to their frequency. Richardson found that the frequency of international wars and the number of causalities each produced followed a power law. More recently, my colleague Erik-Lars Cederman sought to explain Richardson’s findings in his 2003 peer-reviewed publication “Modeling the Size of Wars: From Billiard Balls to Sandpiles.” However, Lars used an invalid statistical technique to test for power law distributions. In 2005, I began collaborating with Pro-fessors Neil Johnson and Michael Spagat on related research after I came across their fascinating co-authored study that tested casualty distributions in new wars (internal conflicts) for power laws. Though he was not a co-author on the 2005 study, my colleague Sean Gourely presented this research at TED in 2009. In any case, I invited Michael to present his research at The Fletcher School in the Fall of 2005 to generate interest here. Shortly after, I suggested to Michael that we test whether conflict events, in addition to casualties, followed a power law distribution. I had access to an otherwise proprietary dataset on conflict events that spanned a longer time period than the casualty datasets that he and Neils were working off. I also suggested we try to test whether casualties from natural disasters follow a power law distribution. We chose to pursue the latter first and I submitted an abstract to the 2006 American Political Science Association (APSA) conference to present our findings. Soon after, I was accepted to the Santa Fe Institute’s Complex Systems Summer Institute for PhD students and took the opportunity to pursue my original research in testing conflict events for power law distributions with my colleague Dr. Ryan Woodard. Power-law relationships, relating events with magnitudes to their frequency, are common in natural disasters and violent conflict. Compared to many statistical distributions, power laws drop off more gradually, i.e. they have “fat tails”. Existing studies on natural disaster power laws are mostly confined to physical measurements, e.g., the Richter scale, and seldom cover casualty distributions. 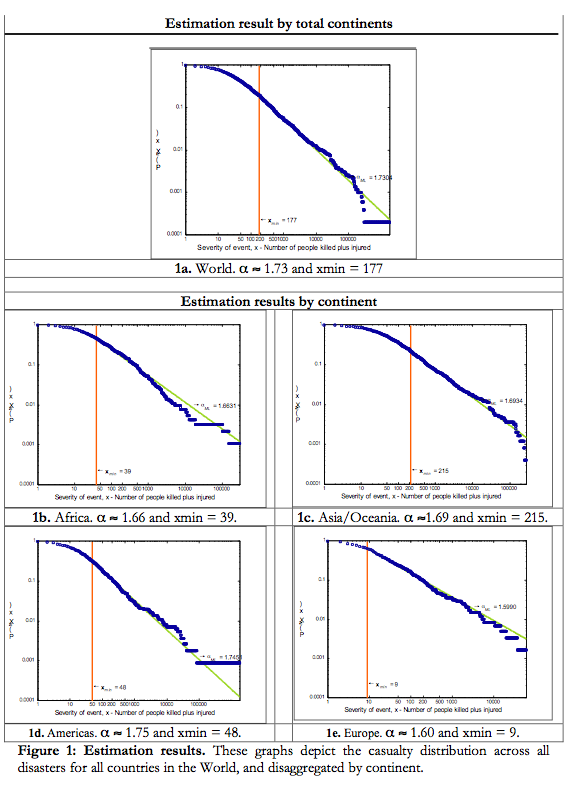 Drawing on the Center for Research on the Epidemiology of Disasters (CRED) International Disaster Database, 1980 to 2005, we find strong evidence for power laws in casualty distributions for all disasters combined, both globally and by continent except for North America and non-EU Europe. This finding is timely and gives useful guidance for disaster preparedness and response since natural catastrophes are increasing in frequency and affecting larger numbers of people. We also find that the slopes of the disaster casualty power laws are much smaller than those for modern wars and terrorism, raising an open question of how to explain the differences. We show that many standard risk quantification methods fail in the case of natural disasters. Dr. Woodard and I presented our research on power laws and conflict events at SFI in June 2006. We produced a paper in August of that year entitled “Concerning Critical Correlations in Conflict, Cooperation and Casualties” (PDF). 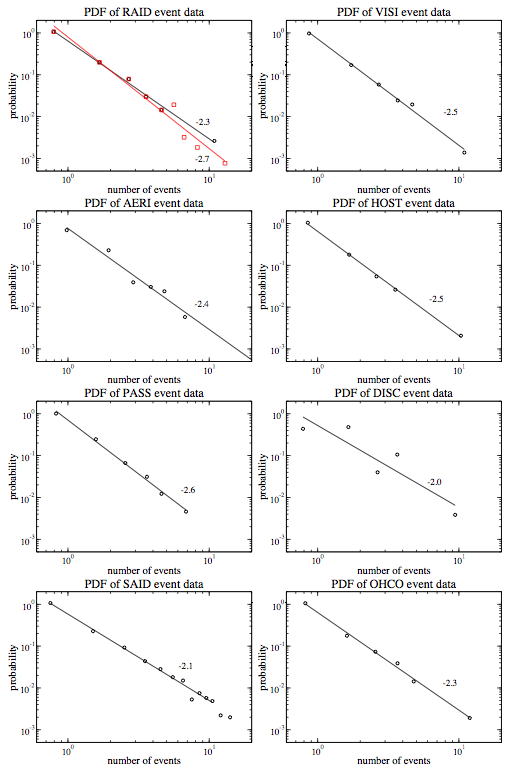 As the title implies, we also tested whether cooperative events followed a power law. As far as I know, we were the first to test conflict events not to mention cooperative events for power laws. In addition, we looked at conflict/cooperation (C/C) events in Western countries. Knowing that the number of casualties of war are distributed as a power law and given a rich data set of conﬂict and cooperation (C/C) events, we ask: Are there correlations among C/C events? Is there a correlation between C/C events and war casualties? Can C/C data be used as proxy for (potentially) less reliable casualty data? Can C/C data be used in conﬂict early warning systems? To begin to answer these questions we analyze the distribution of C/C event data for the period 1990–2004 in Afghanistan, Colombia, Iran, Iraq, North Korea, Switzerland, UK and USA. We ﬁnd that the distributions of individual C/C event types scale as power laws, but only over approximately a single decade, leaving open the possibility of a more appropriate ﬁt (for which we have not yet tested). However, the average exponent of the power law (2.5) is the same as that found in recent studies of casualties of war. We ﬁnd low levels of correlations between C/C events in Iraq and Afghanistan but not in the other countries studied. We ﬁnd that the distribution of the sum of all conﬂict or cooperation events scales exponentially. Finally, we ﬁnd low levels of correlations between a two year time series of casualties in Afghanistan and the corresponding conﬂict events. I’m looking to discuss all this further with Sinan and learning more about his fascinating area of research.